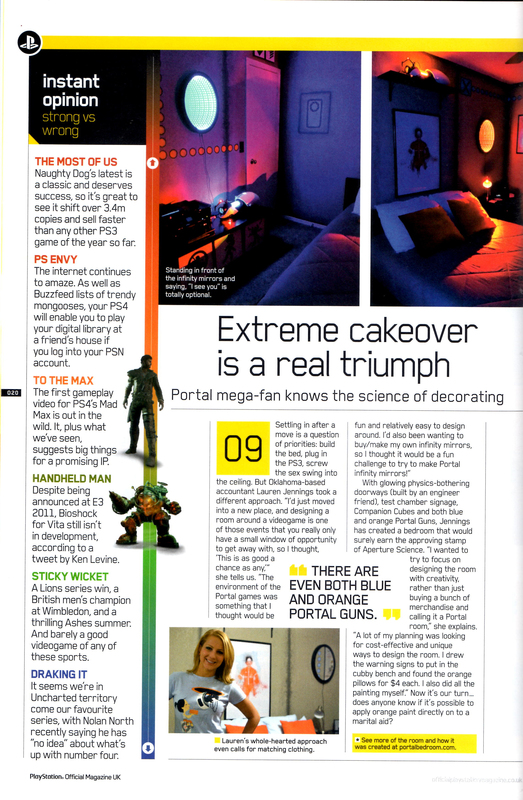 So for a slight update on things: Fellow Portal-enthusiast David was kind enough let me know my bedroom made it into the Playstation Official magazine, and since I’ve been unable to get my hands on this UK-based magazine, also sent me scans of the article that was in issue #87, as well as a follow-up opinion in issue #89! I debuted my Portal Bedroom nearly a year ago, but it’s incredible how I’m still getting acknowledgement and encouragement on my projects. 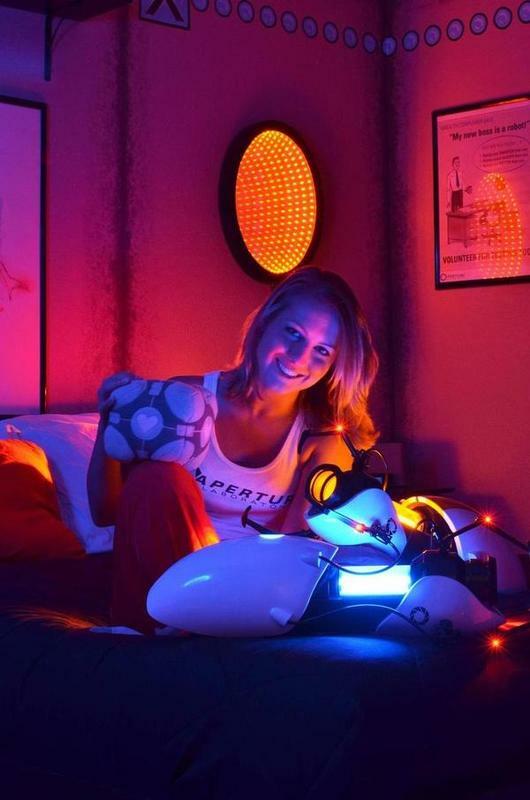 The Portal bedroom project was meant to be some “let’s see what I can make next!” challenge… I never thought that it would be featured on as many online sites as it was (Kotaku, Buzzfeed, Geekologie, Io9, Geeksaresexy, and of course, countless tumblr and pinterest posts!) 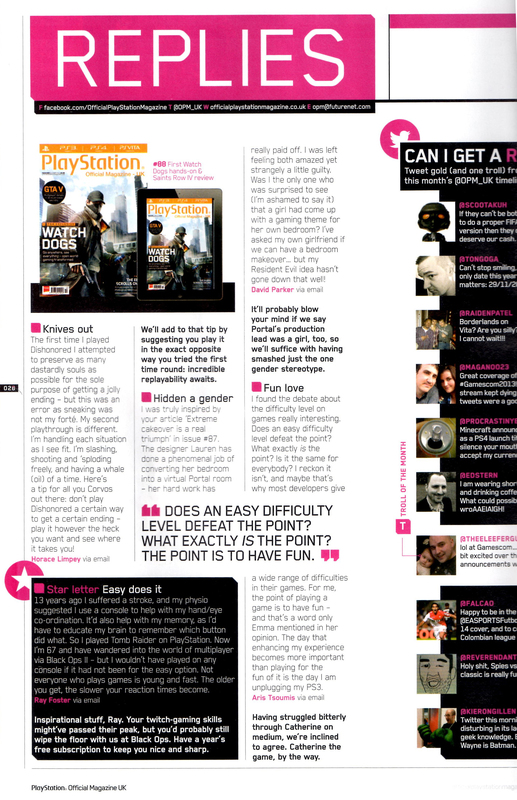 as well as a gaming magazine. For those interested, since posting everything, I’ve only changed a few things to the room… I switched the comforter to black, I obtained not one, but TWO companion cubes, I started a collection of those mystery-box mini-turrents, and I set up my alarm clock to play the Portal-radio jingle you hear in the games. Also since posting, several people have asked me for help/advice with designing their own geek-themed bedrooms (which I’ve been more to happy to help out with!) and I’ve also been commissioned for a handful of future interior-design art projects… a Deco-Art Nintendo room, a Mario-themed nursery, and SEVERAL Doctor Who-themed rooms. There are no definite future interior design projects in development, but I promise once they happen, I’ll make sure to post about the progress! Until then, if anybody’s going to the Dallas Comic-Con in May, hit me up, cause I’ll be there in all my Test-Subject-Jumpsuit glory! Thanks again for all your support guys! Woohooo thanks for making me just that little bit more famous by posting my letter ‘Hidden a gender’ on your wonderful website, I must stress at this point I didn’t intend to stereotype and hope that this didn’t cause offence.